After the sudden death of his wife, Michael King (Shane Johnson) sets out to make a film disproving the existence of the supernatural. He seeks those who practice what he deems to be the darkest arts, believing that, by allowing them to unsuccessfully use him as their subject, he’ll be able to show that their beliefs are false. Unfortunately for Michael, he’s the one that is ultimately proved wrong. 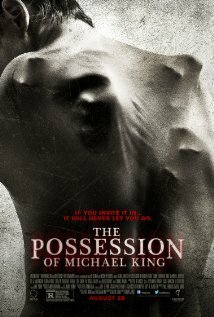 The Possession of Michael King is a good example of how to do about two-thirds of a movie well. I found myself really enjoying the first act of the movie, where Michael King’s skepticism about the supernatural was established in a way that asked the audience to scoff along with him; all the while, acting as a way for the filmmakers to wink in our direction, and let us know that they’re aware of all the usual cliches. It felt like we were all on the same page – and that we should be prepared for something new. Unfortunately, I can’t say that we ever got that ‘something’ that was promised by the beginning of the film. Which is not to say that I’d go as far as to suggest that it fell into the trap of regurgitating the usual cliches of a demonic possession movie, exactly. The Possession of Michael King never really attempts to blur the line between mental disorder and demonic possession, for example – with its protagonist falling squarely and unapologetically in the latter category, with quite a splash at times. But, despite the changes in its format, there is something predictable about the escalation of events, right down to its conclusion. I can’t help but think that the use of a found footage/documentary style of filming was the biggest problem with this movie. Not only did it bring with it a certain degree of stylistic baggage, in terms of how these narratives are told, but there was something too polished about it, which kept bringing me out of the story. I couldn’t help but wonder how so many shots were so perfectly framed, or focused, when there was no one behind (or looking at) the camera at particular moments. So, despite the fact that I can’t really fault it that much, the main disappointment of The Possession of Michael Kane is that it fails to live up to the expectations that its first act promises. Conversely, of course, perhaps it should be praised for having some promise in the first place?